Burundians fleeing pre-election violence rest on the shores of Lake Tanganyika in the Democratic Republic of Congo after a gruelling 22-hour boat journey. More than 100,000 Burundians have fled over the past month, arriving in Tanzania, Rwanda and the DRC. The new head of the United Nations relief arm today released a fresh tranche of crisis funding from the UN Central Emergency Response Fund (CERF) in order to support life-saving relief work for thousands of Burundian refugees dispersed between Rwanda and Tanzania, the Organization has announced. Since early April, nearly 100,000 Burundians have fled across the borders, seeking safety in neighbouring Rwanda, Tanzania and the Democratic Republic of the Congo. A cholera epidemic striking refugees gathered along the shores of Lake Tanganyika in Tanzania has only added to the miseries of the unfolding humanitarian crisis. “Children are arriving at borders sick and malnourished. Many are unaccompanied or have been separated from their families,” Stephen O’Brien, the newly appointed head of the UN Office for the Coordination of Humanitarian Affairs (OCHA), said in a press release issued earlier today. OCHA confirmed that the injection of CERF funds would deliver some $15 million to relief efforts targeting the refugees, with approximately $7.5 million destined for relief agencies in Tanzania and nearly $8 million aimed at supporting the scale-up of life-saving operations in Rwanda. With the political situation in Burundi remaining tense and with continued violence reported, however, UN aid agencies fear that the number of refugees may double over the next six months. According to a recent World Health Organization (WHO) assessment, over 4,000 cases of cholera have so far been reported with the number of new cases falling to 100 a day from a peak of 915 on 18 May. The deaths have been in the port town of Kigoma on Lake Tanganyika, in the nearby villages of Kagunga and Nyarugusu, and among people being transported by ferry from Kagunga to Kigoma. 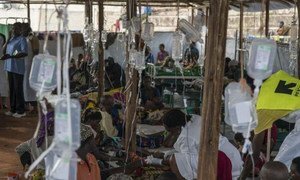 WHO recently confirmed that the cholera outbreak was, in fact, improving but nonetheless warned that the risk of transmission remained high due to limited access to shelter, toilets, water and essential medical care. At the same time, aid agencies in Rwanda remain concerned about high levels of malnutrition and child protection as an estimated 60 per cent of newly arrived refugees are children. Tensions in Burundi have been rising ahead of planned presidential elections at the end of the month, and following an attempted coup 13 May, and the assassination last week of opposition leader Zedi Feruzi. The political crisis erupted when two-term President Pierre Nkurunziza was named by the ruling party in mid-April as its candidate for the presidential election. United Nations-backed containment measures aimed at stemming the deadly cholera epidemic in western Tanzania's Lake Tanganyika region appear to be working, the Organization's refugee agency (UNHCR) announced today amid a tapering off in the number of reported deaths among both Burundian refugees and locals.